Polluted soil is difficult to treat; no single standard for remediation of industrial & mining sites, or urban land. Zhang Chun is assistant editor in chinadialogue’s Beijing office. She holds a Master of Science in hydrology from Graduate University of Chinese Academy of Sciences. Zhang Chun joined chinadialogue in 2012 and works mainly on science and agricultural issues, as both a reporter and editor. chinadialogue is a bilingual website publishing high-quality articles and reports on environmental and climate change issues that affect China and the world. Gao Shengda is secretary of the China Environmental Remediation Association (CERA). CERA was established in 2012 by a few companies and organizations in the environmental remediation industry. It aims to establish industry strategy, promote technological progress and standard development, and facilitate communication & strategic cooperation. On April 17, 2014 results of the first nationwide survey on soil pollution, previously considered a “state secret” was released to the public by the MEP. The survey was conducted between April 2005 and December 2013 by the MEP and MLR. Several experts and officials have warned that the numbers could be on the “conservative” side. Cadmium in soil has risen faster in the southwest & coastal areas of China: up by >50% compared to other areas where it has risien by 40% since the late 1980′s. 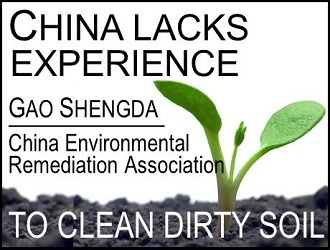 In an interview with chinadialogue, Gao Shengda, secretary of the China Environmental Remediation Association, says China’s polluted land is in urgent need of cleaning up, but at present there is a lack of both experience and legislation. Chinadialogue has kindly allowed us to republish this interview. For the chinadialogue website, please click here. “There is no single standard for remediation of industrial and mining sites, or for urban land. Under this model, the purpose of the site determines what level of pollutants will be classed as “polluted”. For example, lower levels of pollutants might be required for a hospital or kindergarten, than for a factory. At the industry level, we need better technological skills. In the last ten years soil remediation work has mostly been carried out to allow for property development – usually soil is dug up and taken away for treatment elsewhere. That has prevented the sector developing a diverse range of approaches. Overseas it is more common for pollution to be dealt with in situ. That’s cheaper, but takes longer – from one or two years, to 10 or 20.